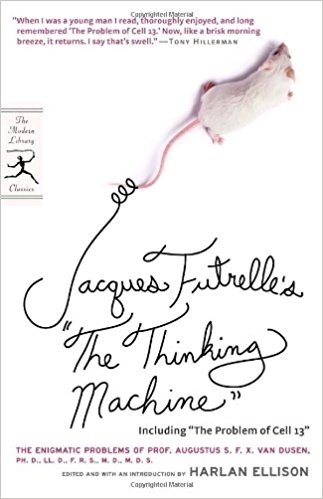 Jacques Futrelle's "The Thinking Machine": The Enigmatic Problems of Prof. Augustus S. F. X. Van Dusen, Ph. D., LL. D., F. R. S., M. D., M. D. S.
I discovered “The Thinking Machine” in one of the “Rivals of Sherlock Holmes” books. Wanting to read more than the few stories offered there, I was excited to see this book available. But there is a major problem. The logic used by Professor Van Dusen is not all that logical. If his first story, “The Problem of Dressing Room A” he makes a jump from a disappearing stage actress to hypnotist without a shred of evidence to support the statement. In his “The Problem of Cell 13” his promise to escape prison in a week is based solely on luck, not logic. Granted, perhaps he could have escaped another way that would have involved more critical thinking, but luck did it for him. He solves a disappearing car by having a bicycle champion follow it, but never examined the scene to confirm how the car got out of the speed trap that only had an entrance and an exit.